Every once in awhile, I am asked what things I miss most from home. Usually this happens when I meet someone for the first time here in London. Obviously, I miss my family and my friends more than anything else, but usually when these questions are asked, it's in the context of finding out about the little things - the small cultural differences or tangible items that make us who we are. In the spirit of Thanksgiving, (which is definitely one thing I will be missing this year!) I thought I would make a short list of things from home that I have perhaps taken for granted before, but find myself missing and being thankful for now. 1) Knowing what side of the sidewalk to walk on - Yes, back in the USA, I took for granted that everyone tended to walk on the right hand side of the sidewalk. It's just a natural thing to do. You drive on the right, therefore you also walk on the right. Here in London, you drive on the left, so naturally I figured everyone would also walk on the left. Not so much. Maybe it's because there are so many people from all over the world here, but people just walk wherever they feel like walking. And even if you are watching where you are going, people are in such a hurry that you might literally get run into, like I did just the other day. 2) Units of Measurement - Although I do think that the metric system is probably much easier to learn and understand, I did not grow up with the metric system. Thus, when people are talking about the weather and say it's going to be 8 degrees tomorrow, it takes me a minute to realize I don't need to find my long underwear just yet. Also, I have no idea yet as to what my baseline running pace is in kilometers per hour. It will take a few more trips to the gym to have that one figured out, I think. 3) Brand names I've grown to know and love - I'd like to give a little shout out to Jif peanut butter, Puffs Plus with Lotion, Swiffer dust cloths, Crispix cereal, and Neutrogena Naturals face cleanser, to name a few. These products were some of the staples in our home and somehow not having those familiar name brands to choose from does make our house seem a bit less homey. 4) Air Conditioning - Yet another modern luxury that I had taken for granted living in our apartment in Chicago. I know not all apartments have central air, but boy how quickly and easily one forgets what it is like to live without it! On a more serious note, I'd also like to say that I am extremely thankful for the opportunity to experience living in another country. I have learned so much already about myself, about other countries and cultures, and about what it really means to be an expat. I am thankful to be doing it in a time when my family and friends can be seen and heard with the click of just a few buttons. All of the issues I listed above are what we'd call "First World Problems", which makes me realize that I also can't express how thankful I am for my ancestors. I'm thankful that they were braver than I will ever be, and were courageous enough to embark on a journey to a new country without any modern day luxuries or means of communication. If they hadn't given up the big things as well as the little things that were important to them, I wouldn't be who I am today. I know the marketing execs at Disney would like you to believe that the Magic Kingdom is the happiest place on Earth. And given that we were at Disneyland Paris last weekend (more on that in a later post), I think I can make an objective assessment about it. In the happiness department, it doesn't hold a candle to Oktoberfest in Munich. That, my friends, is the happiest place on Earth. What's so great about Oktoberfest? For starters, think of it a bit like Thanksgiving. You gather to enjoy friends, family, and fellowship over food and drink at a long table, but servers take care of you. And all around you are hundreds of other tables of Oktoberfest revelers in a tent the size of a football field (of which there are a dozen). Meanwhile, it's like a music festival with bands playing around the clock, and since it's situated in the middle of an amusement park, it also feels like a summer fair. Those who attend come from far and away, so you're guaranteed to meet not just Bavarians but people from cultures all over. Finally, you do all of this in traditional German costume - or at least you should, anyway. More than anything, it feels like a giant party with everyone in a good mood. We flew into Munich the day before Oktoberfest began to meet up with our friends Sarah and Ted, who came all the way from Chicago! 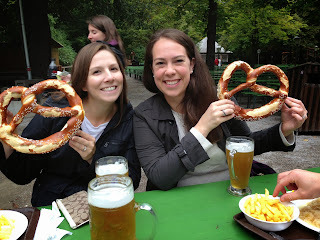 We toured Munich, checking out the Olympic facilities from 1972, outdoor parks, and plenty of shops with steins and cuckoo clocks. Eventually we landed at the original Hofbrauhaus. 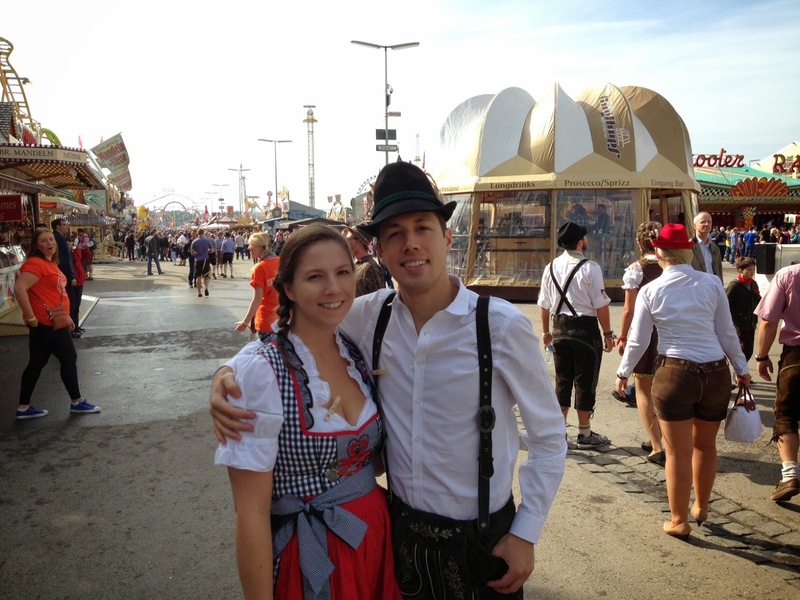 On Saturday, we geared up in our lederhosen and dirndls and headed for Theresenwiese, the site for Oktoberfest. In many of the tents, getting a table can be tricky without a reservation, and we didn't have one. While we were waiting in line to get into the Lowenbrau tent, we noticed an opening at one of the tables outside in the bier garden. With sunshine and temps in the 60s, it was a perfect day to be outside. The four of us quickly got to know our table acquaintances quite well: Deirdre and Dymphne - two Dutch women from Rotterdam, ostensibly in Munich for a dentists conference - and John and Dani - a younger English couple from Nottinghamshire. In fact after a few hours, onlookers might have presumed that we had all known each other for twenty years. Along with our amiable hostess Ingrid, we were blessed with exceptional company. As the afternoon passed, Deirdre told us how she was dying to get inside the tent before she had to leave for Holland the next morning. While the rest of us held our table, she and Dymphne left to look for another way in, and minutes later we saw them pounding the glass to get our attention from inside! We followed their lead and found our way inside, and we all spent the rest of the evening carousing in the tent, meeting even more people from many different places. The next day we met up with some more friends from Chicago - Mauro and Jen who live in Munich along with a few others who had joined them from the states. 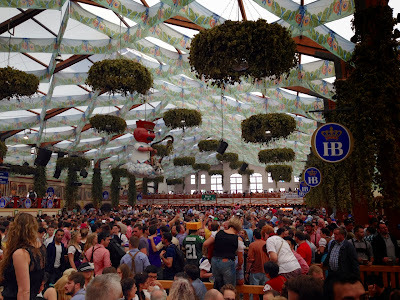 We spent the day in the Hofbrau and Hackerbrau tents, which were equally excellent. Later on - MUCH later - we all convened at Mauro and Jen's house for the Bears/Steelers game which started at 2:30am local time. Dead tired after that, we caught some sleep at the hotel before leaving for London the next day. 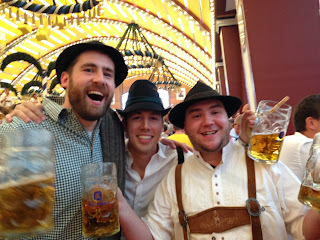 The first time you go to Oktoberfest is a bit like your first experience in Vegas: it feels equal parts fun and overwhelming since there's just so much stimulating activity going on. 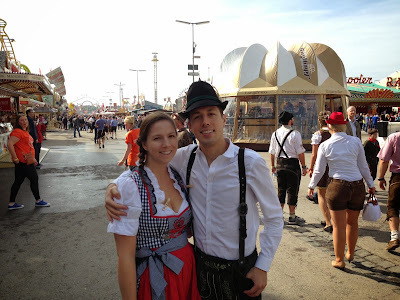 As we left and wondered to ourselves what we would do with our traditional German clothing, it struck us immediately that we should take advantage of the opportunity to go again while we're living in Europe. 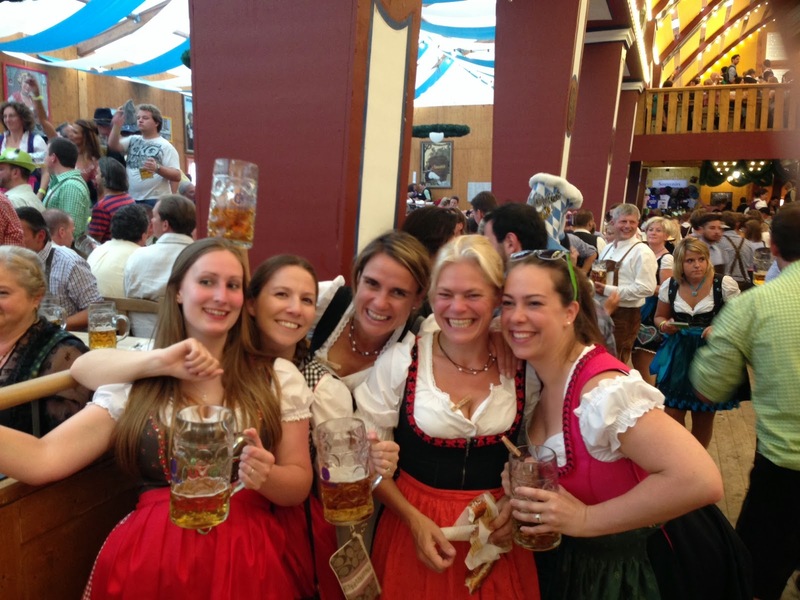 So if you're interested in joining us for Oktoberfest 2014, we will most certainly be going! 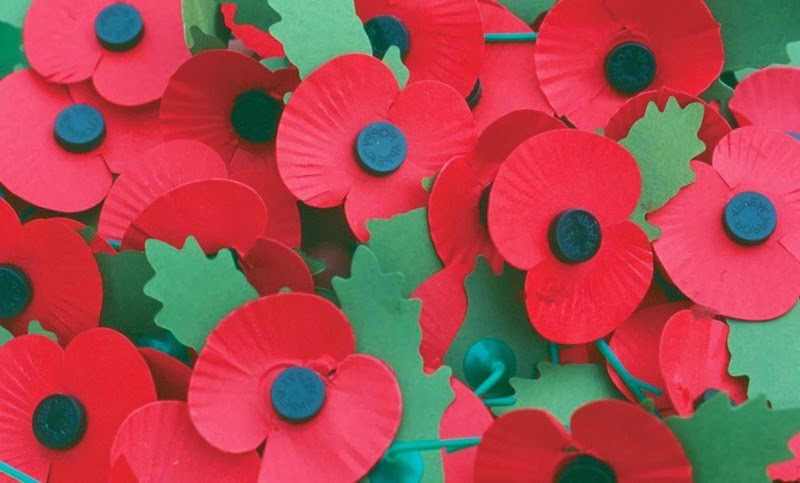 Unlike in the US where Memorial Day and Veterans Day are both recognized and have their own distinct purpose, in England the living and fallen veterans are both honored on November 11, known here as Remembrance Day. In reality, it's more of a Remembrance Week, culminating on the second Sunday of November. During the week, just about everyone can be seen wearing a red poppy on their lapel. The symbolism stems from the blooming of poppies in war-torn Flanders after World War I, as depicted by the poem In Flanders Fields. Members of the Royal British Legion stand on street corners handing them out and collecting donations. On the Sunday before Remembrance Day, tradition is that a poppy wreath is laid by the Queen at The Cenotaph monument in London, near Downing Street. At our Church service, there was a similar laying of a wreath and moment of silence, as well as a sermon denouncing war and emphasizing how poor we are at remembering its seriousness and implications. Even at work on the 11th, there was a two-minute silence observed at 11am. Apparently this is standard practice across the country in pretty much every circumstance. I felt it was appropriate to donate to the cause, and while I didn't wear a poppy during the week, I did pin one to my lapel on Remembrance Sunday. For my entire life and for the majority of conflicts beginning with World War I, the US and the UK have fought side by side as allies in war. I felt it was appropriate to pay my respect to the fallen UK veterans as I would in the US. To all our veterans in the US and the UK: THANK YOU!